These seeds are rich in phytonutrients called isothiocyanates. These phytonutrients are known to have anti-cancer agents. A study published inInternational Journal for Vitamin and Nutrition Research in 2002 shows that isothiocyanates slow down the process of mitosis and triggers adoptosis (cell death) in tumour cells. Another study published in Carcinogenesis: Integrative Cancer Research in 2010 found that mustard powder restricts the growth of bladder cancer as mustard powder is rich in a type of isothiocyanates called allyl isothiocyanates (AITC). In case you want to buy sunrise mustard powder online, then you can go through our list of products. For more details, click here. Yellow mustard seeds contain curcuminoids or curcumin. These anti-oxidants are anti-inflammatory and also has anti-cancer benefits. In a report published in Alternative Medicine Review in 2009, it was found that curcumin can heal pain associated with inflammatory conditions such as irritable bowel syndrome, and rheumatoid arthritis. These seeds are also high in selenium and magnesium and can treat asthma. Add mustard to your meals and this will help you in burning weight. In a study published in Asian Journal of Clinical Nutrition, it was found that the phytonutrient called allyl isothiocyanates has fat burning properties. This same phytonutrient gives mustard its unique flavour. Mustard contains Omega-3 fatty acid which is good for keeping your heart healthy. Eating mustard seeds or powder lowers the cholesterol level and prevents plaque build up in the arteries. Also, these seeds contain antioxidants such as caretonoid and flavonoid; Vitamins A,C and K. These antioxidants and vitamins slow down the ageing process of your tissues. 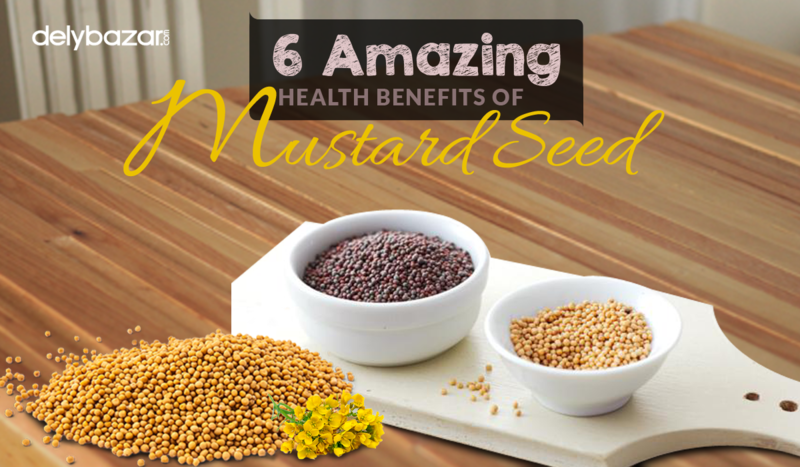 Mustard seeds are loaded with sulphur, which has antifungal and antibacterial properties. This helps ins fighting rashes, fungal growth and other common skin ailments. Since mustard seeds are rich in copper, manganese, and iron, it helps your body in fighting diseases. Mustard generates heat which is beneficial for the nerves. It also has anti oxidative properties which are beneficial for diabetes. Moreover, it relieves constipation. Mustard seed contains mucilage and is rich is fibre which boosts digestion.